Last Christmas we had the full ham and turkey extravaganza. Although I had a sit-down lunch for 15, we had lots left over. This year we are eating a meal that will leave nothing but clean bowls, I hope. Prawns are never cheap and certainly not at this time of year. However, it's still going to cost me a great deal less this year to serve this delicious blend of flavours. Soak 12 bamboo skewers in water for at least an hour before cooking. Cut cauliflower into florets and pulse in a food processor until it resembles rice. Set aside. Combine 2 tbsp of the oil with the lime juice and Tabasco (if using). Dice avocado and mango flesh and place in a small glass or ceramic bowl and toss in the dressing. Stir in capsicum and coriander or mint. Cover and refrigerate. Place cauliflower rice in a frypan with 1 tbsp of the oil. Saute over medium-high heat for 2-3 minutes, then cover with a lid and allow to steam for another five minutes, stirring often. While cauliflower is cooking, preheat barbecue to medium. Thread prawns on skewers and brush with remaining oil. Cook for 2-3 min each side. Season to taste with salt and pepper. Divide cauliflower rice (or jasmine rice, if using) between six bowls. 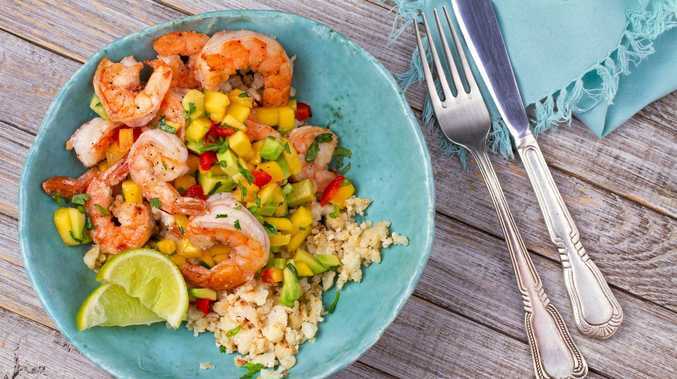 Divide prawns between the bowls and add salsa. Serve immediately.